What can i say about Mr. Moyer but Wow..He provides a inteligent, insightful and humerous program with a fanastic mix of guests. Excellent reporting! Now, who are these players today who've filled the void in funnel of power brokers? Thank you for bringing forth the truth. The insight into the world we live in is spot on. Lets wake up our country to the reality and not the hype. 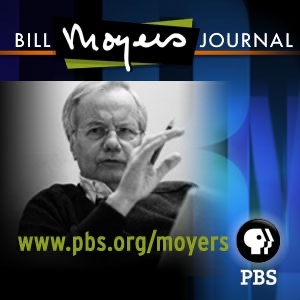 Thanks to Bill Moyers and Company for informative discussions of current topics. Excellent information and ideas to pursue. Calm, enriching, incisive and penetrating are hard to combine in one journalist, but such characteristics defined much of Bill Moyers' time exploring our world and the people in it. Bill Moyers is back! Check out the "Moyers & Company" podcast. Thank you Bill. I miss Bill!!! No one explains things like Bill!!!! He is the only journalist who just tells the story like it is and makes it understandable!! Does anyone know of anyone else that is similar to bill or a podcast like Bills? All Amercan citizens should spend an hour each week with Mr. Moyers. His insight, consideration and sense of fairness and morality awaken the mind. National Treasure, Best there is. A National Treasure, Bill Moyers is one of the very best of this nation. Has proved to be one of my favourite journalist, teacher and a clear voice of reason and compassion. Moyer... Carrying on the mantle of excellence. "until next time, good luck"
some of the best ,most honest, journalism...anywhere. I only wish there were more to choose from. I've listened to them all! Your recent review of audio recordings of LBJ backing us into the war in Vietnam sent ice up my spine. It sounds all to familiar. Today with the political class and much of America with even less to loose in these "two" wars we are fighting now it's good to have a stark reminder of just how bad things can get before anyone has the guts to make a definitive plan. We went to Afganistan as a matter of nessecity but our plan there seemed just as half baked as LBJs. How much longer are we going to be there? I'm sure all Americans want an answer and then someone to make that happen at the appointed hour. Sooner not later. What the world needs now is more Bill Moyers. First class!!! Thank you Mr. Moyers for your excellent communication, intelligence and distinguished demeanor. Great content!!! For the people who think this isn't "fact" based or "biased", you might want to consider the point that perhaps you have been getting your news from the corporate owned media that pretends news is black and white. The main stream media reports the "he said she said" instead of the actual truth. On every major news network republican guests out nuMber democratic guest an average of 3 to 1. I know it's not easy hearing the truth, but that's what you get from Bill Moyers. He is a real journalist in a country that seems to have forgotten what that word even means. I watched a few episodes of this and got tired of the content. He doesn't have two sides discuss issues, but rather just someone who has his point of view. Also, it's really just opinion and not news. There is very little fact-based content. So, if you want to hear opinions that are consistent with Moyers view, this might be good for you. I wanted more news and less opinion. If anyone thinks he is an "unbiased journalist", do me a favor, check his background and listen a bit more closely. Very truthful , honest and unbiased. the interesting topics always provide me with new insight. Thank you! I think Bill is a well respected journalist that is objective and presents fact and not opinion. This is true journalism and not like the current cookie cutter stuff on CNN,FxNews and others. I watched the 7/10/09 video on the web and decided to subscribe to this podcast! Say it isn't so! Podcast is no longer Audio? With a wealth of experience, wisdom & compassion for those without a voice in our corporate-owned country, Moyers brings a great diversity of guests who are usually excluded from the mainstream media. And he actually lets his guests speak... his questions show a remarkable level of lucidity & engagement with the subject matter. All those so-called journalist in the corporate media need to listen and learn from one of the titans of an unfortunately dying art. The last of the best journalists! I am truly amazed by the courage and forsight shown with each program. Thanks for refusing the conform to the sound bite format. Bill Moyers is one of the best journalists EVER. He's an old-fashioned liberal, espousing openness, tolerance and reason for the past 30 years in a television landscape characterized by excitable polit-entertainers and increasingly short soundbites. A poli-sci professor of mine, as Mormon and conservative as they come, liked to show us old Bill Moyers Journal shows--sober, reasoned argumentation and information crosses partisan lines among those who listen. Moyers has lost some hair over the years, but he's still wearing the same glasses and oddly enough, the same suits as he did back in the early days, and he's just as much a beacon of truth in political culture now as he was then. Don't change, Mr. Moyers! We still need you! I quality of this show, either on air or on pod cast is exceptional. Bill has a brillant mind, is articulate, and humane. He tell it as he see it, backs it up with fact, and doesn't let emotion get in the way of the issues. He is a father figure that I hope we all can live up to, what an amazing human being and American! The Journal, some many times has make me laugh, my hair stand up, and o so many times cry in happiness and sadness. Thank you PBS and Bill Moyers and all the folk behind this production. This show enriches my life! i love his show because it often addresses difficult issues in our society and does not dare to ask tough questions. it encourages people to think rationally and behave responsibly. highly recommneded. Moyers continues to showcase the most creative and thought-provoking commentators on television today. Bravo! Great show. You've got to check out the last feature of the show, "Music for Change, Peace by music" and listen to the song "Stand By me". I hope that Itunes offers the songs from this movie. Awesome!! I watch this on PBS, but when I try to subscribe to this podcast, I get: "BILL MOYERS JOURNAL PODCAST | PBS" does not seem to be a valid Podcast URL. Please check that you have entered the correct URL and try again. A well balanced, informative podcast to help understand the context behind confusing / misleading mainstream media spin on important news topics. Highly Recommended. News you can use not contributed by the regular spin doctors. Consistently the most thoughtful guests and discussions on pertinent topics to be had in the public arena today. Seeking truth seems to be a Bill Moyers habit that should be encouraged by all. I am old enough to be aware of the changes this pseudo-intellectual has gone through since he supported the war in Vietnam under Johnson. An empty vessel at best - at worst he expounds shallow thoughts to impress the impressionable. Although he exemplifies the best of capitalism by supporting himself in this way for the past 40 years! If you care at all about our country, if you want to hear in depth reporting that doesn't dumb down stories, if you want to hear analysis that goes beyond partisan talking points and sound bites, Bill Moyers Journal is absolutely essential. No flashy graphics. No rock guitar ins and outs. No glib, in-the-know roundtable sparring (though I do enjoy George S.'s show) Pure news and insight. The very best. A true American patroit. Discourse fit for the Thanksgiving table. Brillant interview. Everyone should listen to what Mr. Bacevich is telling us. Is it too late? You decide. What will you do? Listen to what he has to say about Congress?